I can't believe it has been over 5 months since we came back home from our 3 week holiday to Hua Hin, Thailand. There is not one day that I wish I was back there. If me and my partner had the money, we would be there tomorrow. We loved it that much. The girls really enjoyed themselves too, there are a few things for children to do in Thailand too. There are so many things I miss about Thailand, from the people, blue skies to the ice cream cake, everything! 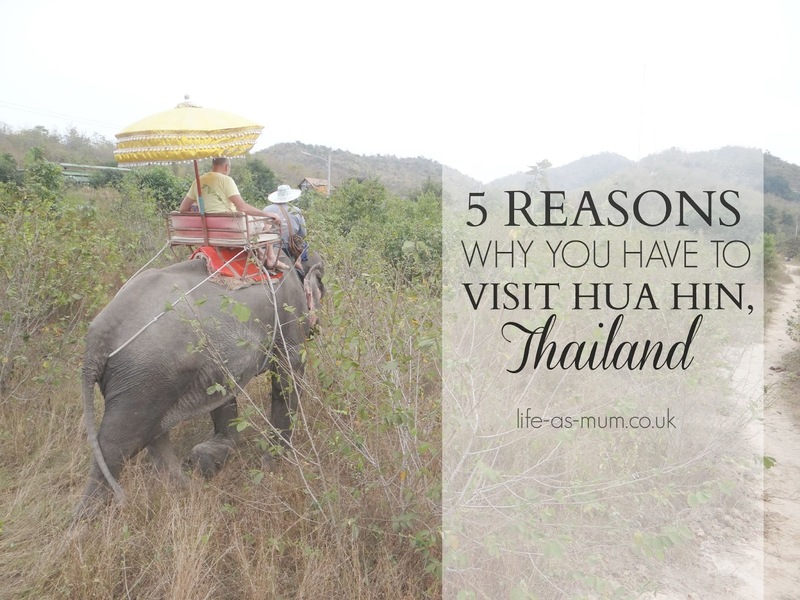 If you haven't visited, or thought about visiting Hua Hin, Thailand, here are 5 reasons to why you SHOULD visit. Even though it is a 12-14 hour plane journey, trust me, it is worth it. Their food is delicious. Some are hot/spicy, of course. But so tasty. I tried a lot of new things whilst I was there. My favourite was Chicken with Cashew Nuts and Garlic with chicken. They were really tasty. Since coming back home I have eaten a lot of Thai food at home. Their reastraunt/cafes are totally different to ours. I don't think there was any café or restaurant I visited which had 4 walls. They were all open, except the ones in the shopping centres. The food in Thailand are extremely cheap, so are their drinks. Ordering food from the side of the road is something I would never do in this country, but in Thailand it is normal. Sometimes the food from the side of the roads were nicer than some of the restaurants and cheaper. When I was in Thailand, it was like a completely different world compared to the UK. A family of 4 or 6 on one scooter, young kids driving scooters, going round the wrong way on roundabouts and kids in no boosters/carseats are all completely normal. Scooters are really popular in Thailand as they are much cheaper and more affordable than cars. You are more than likely too see scooters and pick ups more than cars. The roads are completely different, the way their cables are, so thick and knotted. Every road you go on, you see photos of The King, and home business, such as laundry or selling food on the streets, are all normal. Their way of life is so different to ours. You either see them living in nice houses, or basically plain shacks. It really does look like a Rich or Poor country, no in between. Which is a shame. But it is so interesting how they live. The girls really enjoyed learning a new language. Elliw was overly cute greeting Thai's with both hands together and bowing slightly. I found their language really interesting and I wish I would have tried more instead of being shy. Their beaches are just truly stunning. The views are beautiful. Of course, if you are on holiday, you visit a beach! There are a few beaches but we stuck to one and I honestly can not remember the name of the beach. We did go past Cha-am beach and it was huge, the view was breath-taking. Mia was ina terrible mood so that is the reason we didn't experience anything on that beach. A lot of people think of elephants when they think of Thailand. Mia had the amazing experience to play football with an elephant. We all had a ride on the elephant too. It may sound a bit harsh to some people but you could tell those elephants were well cared for. The baby elephant was just adorable. He really did adore his owner. We went to an elephant charity when we went to have a ride on the elephants. I would really recommend you to experience it. Although I will never go on one again, I think the girls will as they really enjoyed it. If you ever visit Hua Hin, I would advise you to experience the night markets. But I would also advise you not to take kids as it can be extremely busy. A night market is obviously a market at night, where loads of people have their own markets selling food and cheap items such as fake copies and lovely food. Have you ever visited Thailand? If not, have you ever thought about visiting Thailand? What a great time you had! I absolutely love Thailand.... and particularly Thai food! I have fancied Thailand for ages, but it is the additional cost and flights with small children that put me off. I love Thai food - what is your experience of vegetarian food out there? My best friend's daughter went there. #TwinklyTuesday Nice to meet you. Wow, it looks amazing! I hadn't thought of going to Thailand as a family. We were supposed to go there for our honeymoon, but had to change to Sri Lanka due to the civil trouble in Thailand. I really want to go one day though, I would love to hear more about what you did and where you stayed there. It sounds like your girls had a wonderful time, foreign travel is really great for children to experience, especially countries so different to ours. Fab that they got to ride elephants and even play football with one! Thailand is a fascinating country. I recently spent a couple of weeks in a small town in Thailand. Ocean, a few people and untouched nature. It was incredible. I spend days on the beach, taking the sun lounger http://www.beachgiraffe.com/best-beach-chairs-reviews/. Thailand is very beautiful.